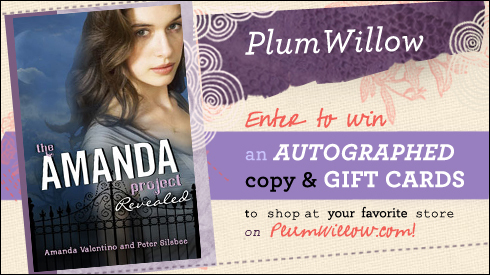 PlumWillow.com is having an amazing contest... 3 winners will receive an autograph copy of The Amanda Project and a $50. giftcard to shop on their site. Sounds fantastic right? To enter that contest GO >>> HERE! What does this have to do with Reading Teen you ask??? An autograph copy of The Amanda Project and a $25. giftcard to shop for amazing outfits on their site! SWEET! yes, I can hear your thoughts. I thought so as well! *contest is for U.S. and Canada Only! *Ends ﻿Sunday, May 8th at midnight EST. *Must be a follower of this blog! Please go to PlumWillows website and check it out! It's very cool, you can design your own outfits and buy them on the spot. WOW! check them out on Twitter @PlumWillow and Facebook.